Huntsman English cheese is a combination of Double Gloucester cheese and alternating inner layers of Stilton blue cheese. Double Gloucester cheese is an English cheddar that historically was made only with the milk from Gloucester cows, which are now almost extinct. The cheese is now produced from the milk of other cattle breeds. 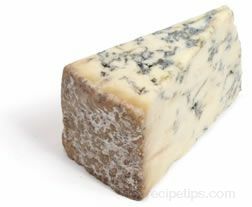 Stilton cheese is an English blue cheese that is made from the whole milk of cows. It becomes more flavorful with age. During the aging process, it is periodically pierced with stainless steel needles to encourage the growth of mold that creates the yellow interior with blue-green veins running throughout. Stilton is rich and creamy but somewhat crumbly. Huntsman English cheese is highly valued for its superior flavor that goes well with Port wines. The flavors of the alternating cheese layers complement each other, which makes Huntsman English a distinctive tasting appetizer or dessert cheese that can be served with beer, hard cider, or wine. Huntsman English cheese is also referred to as Gloucester-Stilton Cheese or Double Gloucester and Stilton cheese. Malvern cheese is produced in the Severn Valley region of the United Kingdom. It is made from unpasteurized sheep's milk. 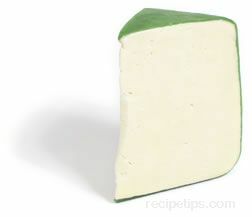 Aged for 2 to 4 months, Malvern is a semi-hard cheese with an ivory to cream color. 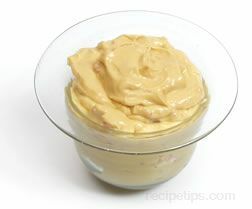 It has a creamy, smooth, mildly sweet flavor with a hint of butterscotch and a slight overtone of thyme. Malvern is a good choice as a snacking cheese or when accompanying grilled foods. It also adds a delicious touch when grated on salads and pasta dishes. Quark is a type of fresh cheese produced in the United Kingdom, Germany, Holland, and any other countries. It is similar to strained yogurt in both flavor and texture; however, some versions of this cheese are produced as curds while others may be smooth and free of the lumps of the small curds. The cheese gets its name from the German word for "curd," which is "quark." Quark cheese ripens in only a few days and typically is made from whole or skimmed milk. Made with a fat content that can range from 10% to 60%, Quark cheese is very similar to the French cheese, Fromage Blanc, but Quark has a higher fat content. 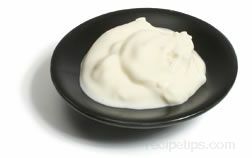 Although quark cheese is much thicker than yogurt, it is just as versatile as yogurt. 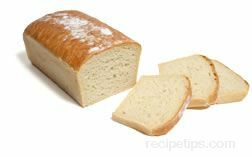 It can be used as a spread for bread or crackers; as an accompaniment for fruit; and as an ingredient for dessert dishes, such as cheesecake. Shropshire is a cow's milk cheese originally from Scotland. It has blue mold veins running throughout the cheese. Shropshire cheese is very similar to Stilton, since it is made in the same manner; however, when making Shropshire, annatto dye is added to the milk, which creates the distinctive orange-toned color of the cheese. The cheese is firm yet somewhat crumbly, and it has a mild tangy blue cheese flavor. The taste is slightly sour but sharper than Stilton, and it has a light, somewhat sweet caramel-like aftertaste. Shropshire cheese is generally aged for twelve weeks or more to achieve the desired effect. Single Gloucester is a type of English cheese that at one time was made only with the milk from Gloucester cows, which are now almost extinct. There are two types of Gloucester cheese: Single and Double. The main difference between the two is that Single Gloucester is made with skim milk combined with a small amount of whole milk and Double Gloucester is made entirely from whole milk. Both types have a natural rind and a hard texture, but Single Gloucester is more crumbly, lighter in texture, and lower in fat. 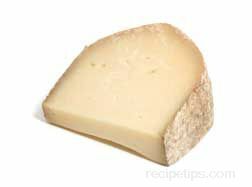 Single Gloucester also has a milder flavor than Double Gloucester, and it is a bit easier to break apart. It isn't allowed to age for as long a period as Double Gloucester. Both types are produced in round shapes, but Single Gloucester cheese rounds are smaller. Single Gloucester can be enjoyed as a snack or appetizer. It is a good choice for grating or grilling. Stilton is an English blue cheese made from the whole milk of cows. It has long been one of the most favored English cheeses, both within England and throughout the rest of the world. It is aged for up to five months and sometimes even longer. While it is being aged, it is pierced several times with stainless steel needles to encourage the growth of mold, which are the blue-green veins running throughout the yellow interior, all of which is surrounded by a crusty rind. Stilton Blue cheese is rich and creamy but somewhat crumbly. It has a light tangy, nutty flavor that becomes stronger and more flavorful with age. It is a highly valued cheese for its superior flavor, which goes well with Port wines. 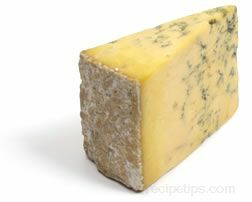 Stilton is also available as a Gloucester-Stilton combination with the Gloucester cheese layered over and alternating with inner layers of the Stilton Blue cheese. The flavors of both cheeses complement each other, providing a distinctive-tasting appetizer or dessert cheese. 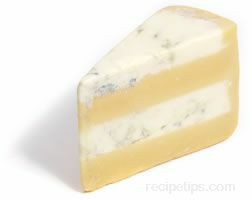 Stilton cheese is also available as a white cheese, which is a younger version that doesn't have the blue mold veining. This younger version is used as an ingredient for salads or as a good table cheese. Developed in the Leicestershire region of England, White Stilton cheese is a younger version of the famous Stilton Blue cheese. Because the cheese is younger, it doesn't contain the blue mold veining of the aged cheese. White Stilton is made from cow's milk and has a very pale yellow color with a natural rind. It has a flavor that is much milder than Stilton blue cheese. White Stilton is often used as an ingredient in salads, and it is a good choice as a table cheese. Wellington is an English cheese made from the milk of Guernsey cows. It has a yellow color and becomes similar to Cheddar cheese as it ages. Wellington cheese is produced in small rounds that have a grayish-brown natural rind. It is usually aged for six to ten weeks. Wellington is an excellent general purpose cheese. Originating in the Cheshire area of England, Wensleydale cheese was traditionally a blue mold cheese. 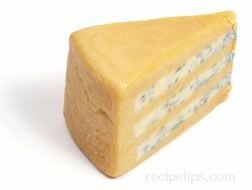 Although the blue mold variety is still made, the cheese is most often produced as a white cheese that is crumbly and has a mild flavor. 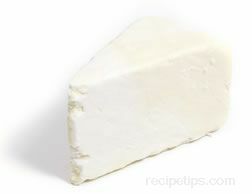 It is often considered to be comparable to a white cheddar. The cheese is usually not allowed to age for very long periods before it is sold, which generally creates the best flavor.